At least 33 people were killed in a US-led coalition strike on a school used as a centre for displaced people near a jihadist-held Syrian town, a monitor said on Wednesday. LEBANON: At least 33 people were killed in a US-led coalition strike on a school used as a centre for displaced people near a jihadist-held Syrian town, a monitor said Wednesday. 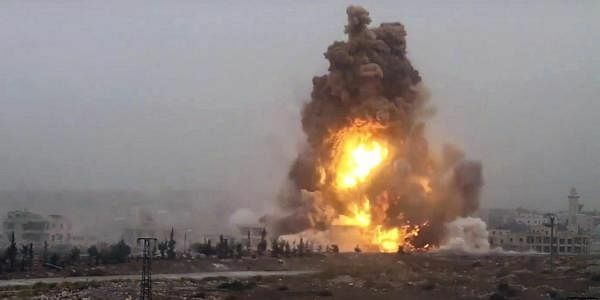 The Syrian Observatory for Human Rights said the strike south of Al-Mansoura, a town held by the Islamic State group in the northern province of Raqa, "took place in the early hours of Tuesday." "We can now confirm that 33 people were killed, and they were displaced civilians from Raqa, Aleppo and Homs," said Observatory head Rami Abdel Rahman. "They're still pulling bodies out of the rubble until now. Only two people were pulled out alive," Abdel Rahman told AFP. The Britain-based monitor -- which relies on a network of sources inside Syria for its information -- says it determines what planes carried out raids according to their type, location, flight patterns and the munitions involved. "Raqa is Being Slaughtered Silently," an activist group that publishes news from IS-held territory in Syria, also reported the raids. "The school that was targeted hosts nearly 50 displaced families," the collective said. The US-led coalition has been bombing IS in Syria since 2014 and is backing an offensive to defeat the group in Raqa city, the de facto heart of the group's so-called "Islamic caliphate". Earlier this month, the coalition said its raids there and in Iraq and unintentionally killed at least 220 civilians. But other monitors say the number is much higher. More than 320,000 people have been killed and millions more displaced since Syria's conflict erupted in March 2011 with protests against President Bashar al-Assad.